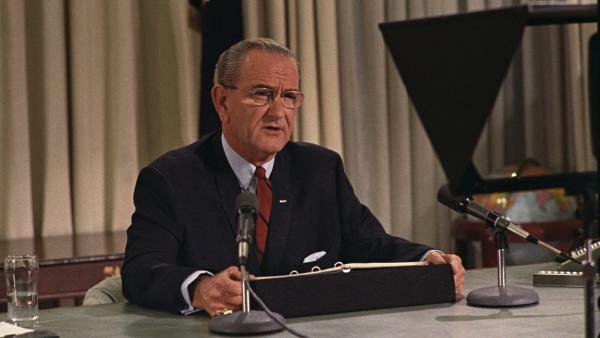 President Lyndon B. Johnson seen here in March 1968. October 22 of that year, Johnson signed the Gun Control Act of 1968 into law. When Congress passed the 1968 Gun Control Act, it was one of the first attempts by the federal government to address who was too dangerous to buy a firearm. In the 50 years since, our understanding of mental illness has become more nuanced, while federal regulations largely have not. The bill, which still today forms the bedrock of federal gun regulation, disqualifies a person who “has been adjudicated as a mental defective or has been committed to any mental institution,” from purchasing a gun. Paul Appelbaum, a professor of psychiatry at Columbia University, says this qualification is too simplistic. Research shows that people with a mental illness are widely not violent. In fact, just 3 to 5 percent of violent crimes are committed by someone with a mental illness. Alcohol and substance abuse are more closely associated with a higher risk of violence than mental illness is. But today, as in 1968, conversations about gun control often include mention of mental illness. In the 1960s, the public and some of the medical community believed people with mental illnesses were dangerous, said Jeff Swanson, a professor in the department of psychiatry at Duke University School of Medicine. “At that time, commitment was a little easier and at a lower threshold based on a psychiatrist believing that someone really needed treatment and was not capable of making that decision on their own,” Swanson said. Though people committed for mental health treatment need not be violent, the 1968 law treated commitment as a referendum on fitness to buy a firearm. Today, if a person is exhibiting signs they could harm themselves or others, a family member or law enforcement official can petition a judge to mandate treatment. That person’s firearms aren’t necessarily seized, but if the person is involuntarily committed, they are barred by law from purchasing guns. Marcia Morey saw many commitment hearings during her 18 years as a district court judge in North Carolina. But she also heard many other cases, involving domestic violence or homicide. “I can’t tell you the number of times I sat on the bench and heard testimony from a family member who said, ‘We saw the warning signs. He had access to a gun.’ And yes, there was a shooting. There was a murder,” Morey said. 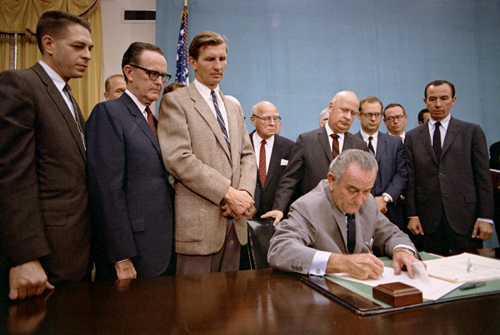 President Lyndon B. Johnson signs the Gun Control Act of 1968 as others look on. These laws allow a family member or law enforcement official who believes a person is dangerous and likely to hurt themselves or others to ask a court to temporarily seize that person’s firearms. Red flag laws are controversial. Some believe they infringe on Second Amendment right and worry that courts could take away guns without due process. Morey’s bill failed to make its way through the North Carolina State Legislature before the end of the session last spring. Since the Parkland shootings, 13 states have built on federal gun regulations by passing red flag laws or ERPO bills and many more are considering them. Some of the bills up for debate in state legislatures around the country include language about mental illness, including North Carolina’s. Appelbaum, however, is among the experts that say looking at mental illness is the wrong way to address violence and could further the stigma that people with mental illness are violent and dangerous. Red flag laws are usually framed as preventing mass shootings or homicides, though there is little evidence to suggest that. In reality, two-thirds of U.S. gun deaths are by suicide. Appelbaum says red flag laws may fill a gap in preventing gun violence, not as the sole solution but perhaps as part of it. Several media reports indicate Fort Worth Police Chief Joel Fitzgerald is reportedly stepping down to lead the Baltimore force. But Fort Worth police tell KERA that he has not accepted another job offer at this time. The Baltimore mayor's office told KERA that "the process is still underway and no decision has been made."